Being "Lutheran," our congregation accepts and teaches the Bible-based teachings of Martin Luther that inspired the reformation of the Christian Church in the 16th century. 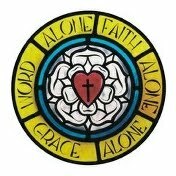 The teachings of Luther and the reformers can be summarized in three short phrases: Grace alone, Faith alone, Scripture alone. This is but a short summary of what we believe. To learn more about what our church believes, teaches, and confesses, please contact us or visit the Lutheran Church—Missouri Synod website at www.lcms.org. Subpages (2): Holy Communion Who was Martin Luther?